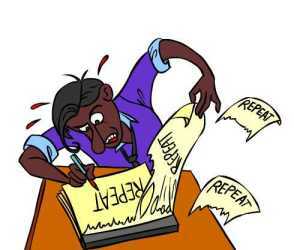 The Italian verb for repeat is the regular -ERE verb ripetere. ... imagine you RIP paper each time you repeat a word! - ripetersi (che) (vr) : to repeat oneself, to tell oneself (that). - ripetibile (adj) : repeatable, repeat. - la ripezione (nf) : repetition; (pl) coaching, tutoring, private lessons. - Può ripetere? / Puoi ripetere? : Can you (form/inf) repeat that? Other regular ERE Verbs conjugated in this way include : battere, combattere, controbattere, eccedere, mietere, gemere, fremere. Learn, repeat and remember new Italian words quickly and easily, try Cartoon Memory Triggers! To remember a word, just think of the pic! Imagine you RIP paper each time you repeat a word! non ripetere (non) ripeta! (non) ripetiamo! (non) ripetete! (non) ripetano! ✔ Ripetere is a regular -ERE verb. ✔ Learn ripetere and it will reinforce the pattern for ALL other regular -ERE verbs. ✔ Do the daily verb every day to gain a solid knowledge of the -ERE and other verb familes' conjugation patterns. ✔ You can more easily remember words and verbs like the Italian for repeat - ripetere using the techniques of the world's Memory Masters. 200 Words a Day! Free Daily Italian Lesson Online - the verb in Italian for repeat is ripetere - fully conjugated. Italian Learning Made Fun and Fast with your free Daily Italian Verb Lesson - ripetere.